cci.org | Why Are These Puppies Doing Time In Prison? Nashville, Tennessee -- They arrive from Canine Companions for Independence® at the Hardeman County Correctional Facility in Tennessee as little yellow and black cute balls of fur full of purpose and potential, but in need of partners to help prepare them to be working assistance dogs. The Hardeman County facility inmates become volunteer puppy raisers, teaching basic obedience and more than 30 commands to help adults, children and veterans with disabilities. After a rewarding day of work learning commands, the puppies get in some playtime and sleep in large kennels next to their inmate puppy raisers. There are six inmates at the medium security prison for men who are assigned to conduct training. Selection is based on a number of factors to ensure consistency in training – length of sentence, a good conduct record and demonstration of leadership and good character. Raising puppies in one of the 15 prison puppy raising programs not only benefits Canine Companions and the puppies, but the inmates as well. The recidivism rate for the prisons that participate in the Canine Companions puppy raising program is very low and inmate handlers often express appreciation for the opportunity to contribute to the community in a positive way. The Hardeman County facility is the newest prison program helping Gift the Gift of Independence and Give a Dog a Job®. 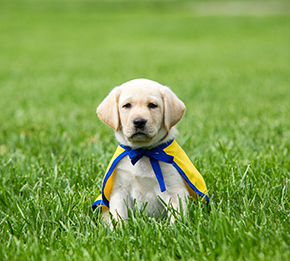 Established in 1975, Canine Companions for Independence has six training centers across the country and has placed over 5,500 assistance dogs. Canine Companions is recognized worldwide for the excellence of its dogs, and the quality and longevity of the matches it makes between people and dogs. There is no charge for the dog, its training and a lifetime of ongoing follow-up services. For more information, visit www.cci.org or call 1-800-572-BARK.